Location: 4 Stuyvesant St. 2nd Fl. Feelings: There are few things I never learned while living in Japan. I only know how to speak Japanese like a 10 year old, I don't know how to clean and prepare a meal while my husband is at work, and most importantly, I can't figure out how to unwrap machine-made rice balls. You can find these little puzzles at Zaiya. I even read the tutorials on Midtown Lunch, but I could never take out the nori properly. I am a failure as an Osaka native food blogger. Then, when I stopped at Sunrise Mart, I found non-complicated, non-machine-made rice balls with various fillings! 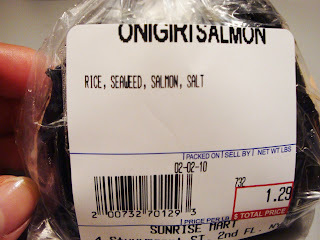 I picked up two salmon rice balls ($1.29 each) right away. Nori is already wrapped, and salmon and the rice are already mixed. This is my dream rice ball like I could find at Omsb. 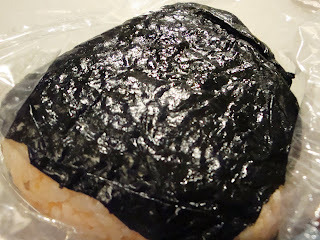 Since the nori is not separated, it is mushy from the heat of rice, which might make some people unhappy. But these rice balls look and taste home made unlike many of the machine made ones at Zaiya. They are not perfectly triangular, but every bite is flavorful, and there is heart and warmth in it. I don't need to know how to unwrap those machine-made rice balls any longer! I will stick to the hand made ones. They follow the actual meaning of "Omusubi" (rice ball in Japanese), which is to tie or connect one another. Machines can't tie those grains of rice to us and expect us to feel any connection. Only a person who's making the rice into a ball with his own two hands can bring the warmth to a real rice ball.